Today Google has outed the December issue of its developer-focused Android platform distribution chart (which you can see in the image below). This basically tells us how much progress new versions of the OS have made each month when it comes to market share. 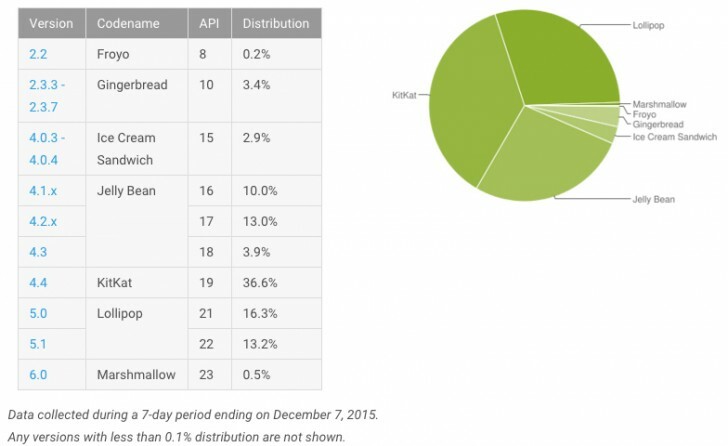 The newest iteration of Android is version 6.0 Marshmallow, which is now on 0.5% of devices out there. That's up from 0.3% last month. In the meantime, Lollipop has climbed to 29.5% market share, almost 4% more than in November. With 36.6% of the market, KitKat has dropped slightly, while the three Jelly Bean releases taken together are now at 26.9%, around 2% less than last month. Ice Cream Sandwich and Gingerbread have both lost some market share, will the ancient Froyo is still stuck at 0.2% for whatever reason. Devices running older versions of the OS are not included, as you can see. Marshmallow's numbers will clearly improve in the first half of next year, when we expect to see many 2015 devices receiving updates to Android 6.0. Wish they all told us which phones are guaranteed to get quick updates (no later than a month after the code is released by Google) for at least two straight years, and actually stick to that promise.